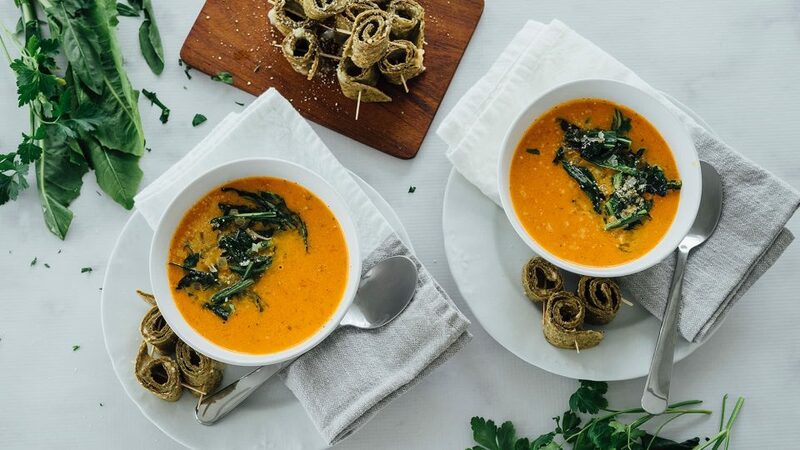 Dandelion Greens and Tomato Soup Recipe | What’s for Dinner? Hit the refresh button on your go-to soup and sandwich combo with dandelion greens and mini roll-ups, made of Angelic Bakehouse® 7-Grain Kale & Spinach Wraps. Preheat oven to 425°F. Slice tomatoes in half and toss in a large bowl with 2 tablespoons of olive oil, salt, and pepper. Spread an even layer on a parchment-lined baking sheet and roast until tender, about 35 to 40 minutes. Heat 1 tablespoon of olive oil in a large soup pot over medium heat. Add onion and cook until translucent, about 5 minutes. Add garlic and red chile flakes and cook until fragrant, about 30 seconds. Add tomatoes with any accumulated juices, stock, thyme, and basil. Stir to combine. Raise heat to a simmer, cover, and cook for 25 to 30 minutes. Remove from heat and use a blender or immersion blender to puree. Add heavy cream and stir to combine. Heat the remaining 1 teaspoon of olive oil in a medium skillet over medium heat. Cook shallot until soft, about 3 to 4 minutes. Add dandelion greens and cook until bright green and slightly wilted, about 3 to 4 minutes. Season with salt and pepper and remove from heat. To assemble the rollups, place wraps on a cutting board or work surface. Spread caesar dressing on each wrap and top with Parmesan cheese. 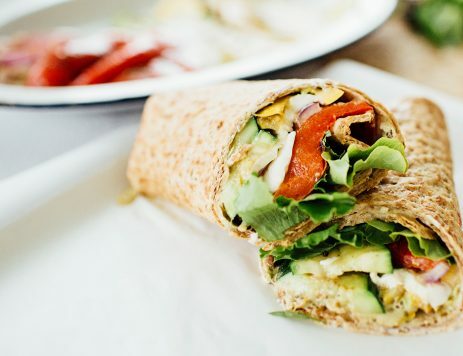 Roll up each wrap to form a log shape and slice into pieces. 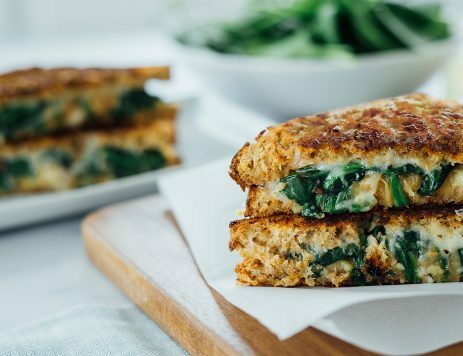 Serve with soup topped with dandelion greens.